Some preparations are necessary before changing a wheel. – If you have a flat tyre, stop the car well away from moving traffic. Choose a location that is as level as possible. – All passengers should leave the car. They should wait in a safe place (for instance behind the roadside crash barrier). – When towing a trailer: unhitch the trailer from your vehicle. – Take the tools and the spare wheel* out of the luggage compartment. If you have a puncture in moving traffic, switch on the hazard warning lights and place the warning triangle in a visible location. This is for your own safety and also warns other road users. Please observe the relevant regulations. Change the wheel as described below. – Pull off the hub cap. Also refer to, “Hub caps”. – Loosen the wheel bolts. – Raise the car with the jack*. – Take off the wheel with the flat tyre and then put on the spare wheel*gggggg 291. – Lower the vehicle to the ground. – Tighten the wheel bolts firmly in diagonal sequence with the box spannergggggg 289. – Fit the hub cap back on. What you must do after changing a wheel. 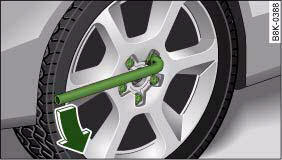 – Place the wheel with the defective tyre in the spare wheel well and secure it. – Put the tools and the jack* back in the luggage compartment. – The inflation pressure of the newly fitted spare tyre must be checked as soon as possible. – Have the tightening torque of the wheel bolts checked as soon as possible with a torque wrench. The correct tightening torque is 120 Nm. – Have the flat tyre replaced as quickly as possible. • If you notice that the wheel bolts are corroded and difficult to turn when changing a wheel, they must be replaced before having the tightening torque checked. • In the interest of safety, drive at moderate speeds until the tightening torque of the wheel bolts has been checked. The hub caps must be removed for access to the wheel bolts. 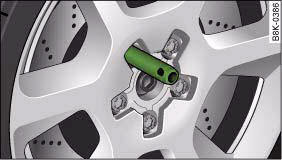 – Insert the hook (provided in the vehicle's tool kit) in the hole in the hub cap. – Pull off the hub cap ⇒ fig. 271. – Fit the box spanner as far as it will go over the wheel bolt5). 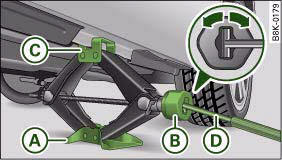 – Grip the box spanner as close to the end as possible and turn the wheel bolts about one turn anti-clockwise, fig. 272 -arrow-. – Grip the box spanner as close to the end as possible and tighten the bolt firmly by turning clockwise. To avoid accidents, the wheel bolts should only be loosened slightly (about one turn) before raising the vehicle with the jack*. • If the wheel bolt is very tight, it may be possible to loosen it by pushing down the end of the spanner carefully with your foot. Hold on to the car for support and take care not to slip. The vehicle must be raised with the jack* to remove the wheel. Each jacking point is marked by a recess underneath the vehicle ⇒ fig. 273. – Place the jack underneath the jacking point closest to the wheel being changed. Make sure the base plate A is flat on the ground. – Wind up the jack by the knob B until the claw of the jack C completely surrounds the seam on your vehicle ⇒ fig. 274. – Now fit the crank handle D onto the jack by inserting it in the opening on the knob, fig. 274. Turn the crank handle clockwise or anti-clockwise to secure it in place. – Raise the vehicle by winding the crank handle until the defective wheel is clear of the ground. Recesses at the front and rear of the door sills mark the jacking pointsgggggg 290, fig. 273. There is one jacking point for each wheel. 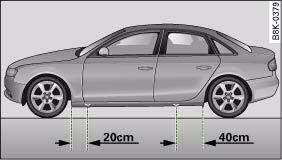 The distance from the jacking points to the wheel arches is approximately 20 cm at the front and 40 cm at the rear. The jack may only be applied at the seam of the jacking points shown. An unstable surface under the jack may cause the vehicle to slip off the jack. Always provide a firm base for the jack on the ground. If necessary use a large, strong board or similar support. On a hard, slippery surface (such as tiles) use a rubber mat or similar to prevent the jack from slipping. • Prevent the base of the jack from slipping – risk of injury. • The car can be damaged if the jack is not applied at the correct jacking points. There is also a risk of injury since the jack can slip off suddenly if it is not properly engaged. Step-by-step instructions for taking off the wheel and putting on the spare wheel. Change the wheel as described below after loosening the wheel bolts and raising the vehicle with the jack*. 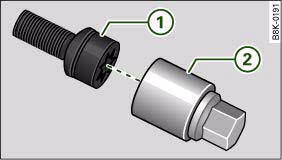 – Using the hexagonal socket in the screwdriver handle (provided in the vehicle's tool kit) ⇒ fig. 275, unscrew the wheel bolt nearest to the top and place the bolt on a clean surface. – Screw in the mounting pin (provided in the vehicle's tool kit) by hand in place of the wheel bolt, fig. 276. – Then unscrew the other wheel bolts as described above. – Take off the wheel. The mounting pin stays where it is. – Put on the spare wheel, using the mounting pin to guide it into place. – Screw in the wheel bolts and tighten them lightly using the hexagonal opening in the screwdriver handle. – Then unscrew the mounting pin and tighten the remaining wheel bolt lightly. 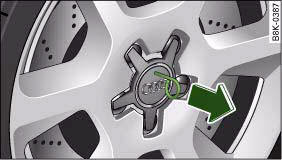 – Carry out the steps required after you have changed the wheel, “After changing a wheel”. The wheel bolts should be clean and turn easily. Before putting on the spare wheel, inspect the condition of the wheel and hub mounting surfaces. These surfaces must be clean before mounting the wheel. The wheel bolts are easier to remove from the wheel rim if you use the hexagonal socket in the screwdriver handle. The reversible screwdriver blade should be removed as a precautionary measure when the tool is used for this purpose. Note the direction of rotation when putting on a tyre with directional tread pattern. Tyres with directional tread pattern must be mounted so that they rotate in the correct direction. A directional tread pattern is identified by arrows on the sidewall pointing in the forward running direction. Always note the direction of rotation indicated when mounting the wheel. This is important so that these tyres can give maximum grip and avoid excessive noise, tread wear and aquaplaning. Drive carefully should you ever have a puncture and have to mount the spare wheel so it rotates in the wrong direction. This is because the tyre will not give optimum performance. Bear this in mind particularly when driving on wet roads. To benefit from the advantages of tyres with this type of tread pattern, the defective tyre should be replaced and refitted as soon as possible so that all tyres again rotate in the correct direction. – Pull off the hub cap, fig. 271. – Insert the adapter 2 completely into the wheel bolt 1. – Fit the box spanner as far as it will go over the adapter 2. – Loosen or tighten the wheel bolt. It is advisable to carry the wheel bolt adapter in the vehicle. The adapter is normally stored in the vehicle tool kit, underneath the towline anchorage. It should be put back there after use. The code number of the anti-theft wheel bolt is stamped on the front of the adapter. Your Audi dealer will need this number to replace the adapter if lost. Note the code number of the anti-theft wheel bolt and keep it in a safe place – not in your vehicle.